Today casual look with leopard detail, electric blue sweater by online shop BaBaSSu. I wear this look with denim shirt for La Roche-Posay event in Bogota. La Roche es one of the dermathologist Loreal's brands based on the thermal water with beneficial properties for the skin, discovered in the french village of the same name. Its therapeutic reputation was known for ages and they have in a village own thermal centre recognize by French Academy of Medicine. These thermal waters are anti-oxidant and rich in selenium, which makes them perfect for the most sensitive skin. I personally really like this brand so I was really happy about suprise gift from the company: Thermal spring Water and sunprotector Anthelios XL SPF 50+. Enjoy the pictures! And don't forgot to check my another post with leopard details here. Últimamente fui invitada al evento de La Roche-Posay y me decidí por un look poquito nerd, lleve jersey con detalle de estampado animal de tienda online BaBaSSu combinado con una camisa denim. 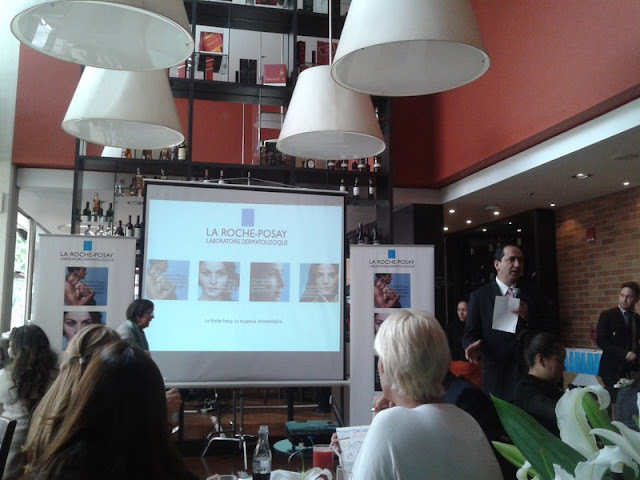 La Roche Posay es una de las marcas activas de Loreal recomendadas por dermatologos. Es basada en las aguas termales con propiedades beneficiosas para la piel, descubiertas en el pueblo francés del mismo nombre. Su reputación terapéutica esta conocida desde siglos y fue reconocida por la Academia Francesa de Medicina. Estas aguas termales son anti-oxidantes y ricas en selenio, lo que las hace perfectas para las pieles más sensibles. Personalmente me gusta mucho esta marca, así que estaba muy contenta por el regalo sorpresa: agua termal y sunprotector Anthelios XL SPF 50 +. Disfrutan las fotos! Y no se olvidan mirar mi otro post de estampados animales aquí. Ostatnio zostałem zaproszona na promocje marki La Roche-Posay i zdecydowalam sie zalozyc stylizacje trochę nerd, mialam na sobie sweter w cetki na rekawach ze sklepu internetowego BaBaSSu a do tego jeansowa koszule. Dla ciekawskich La Roche-Posay jest jedna marek Loreal zalecana przez dermatologów. Jest ona oparty na wodach termicznych o korzystnych właściwościach dla skóry, odkrytych we francuskim miasteczku o tej samej nazwie. Ich terapeutyczne wlasciwosci znane sa od stuleci i zostały potwierdzone przez Francuską Akademię Medyczną. Te termalne źródła są bogate antyoksydanty i selen, co czyni je idealne nawet dla najbardziej wrażliwej skóry. Osobiście bardzo lubię tę markę, więc bardzo sie ucieszylam na prezent niespodzianke: wode termalna w sprayu i krem ochronny Anthelios XL SPF 50 +. Zapraszam do ogladania zdjęc! I nie zapomnijcie obejrzeć moje inne posty o zwierzecych nadrukach. And below I leave you with pictures from the event of La Roche-Posay. Abajo os dejo con fotos del evento de La Roche-Posay. We love love love your sweater and necklace!!! Great outfit honey <3 Love the sweater! Me encanta la sudadera! Es genial. Hello from Spain: thanks for recommending mark creams. I also love your outfit .... We keep in touch. Que bonito outfit, me encanta el jersey. Todo el look es una maravilla. Tus botas son preciosas y quedan de maravilla con estos pantalones. Sweterek jest przeuroczy ;) Pozdrawiam, Edith. Me encanta el jersey y uso algunos productos de Roche-Posay y son muy buenos. Loving your outfits with bargain clothes.This makes blogging more real. I've been following u for a very long time babe! Love the colour. Looks great on you. love the whole look, especially those rider boots. Gorgeous sweater ... Nice blog! Beautiful pictures and its indeed an amazing post!! Beauty boots!! Yo de la Roche Posay no he usado nada pero todo el mundo habla muy bien de ella! La roche posay jest jedną z moich ulubionych marek :) Mają naprawdę świetne kosmetyki!! Beautiful outfit! I'm in love with your sweater! Cute face, smile, and hair. I also love your boots and that necklace. You look absolutely wonderful! Amazing ! looove the outfits ! i love your outfit, beautiful sweater! Estas muy guapa de azul. Lovely outfit, love the sweater! soooo pretty. love this look. Such a cute look and a fun party! Hope you are having a wonderful day! Really cute, you sweater is cute! This is such a sweet look , your boots are so gorgeous. Great post! Very nice sweater! You want to follow each other in Bloglovin too? I love the leopard detailing and the necklace is amazing. you look great as always. very nice sweater and pants. Have a great day. Cute blog, what about following each other through GFC, Bloglovin and Lookbook? Just let me know! I'm serously in love with your sweater! Me encanta el collar!! Es precioso!! Un look muy acertado! I love this look and how you paired it with riding boots! Jetem pod wrażeniem, przepiękne stylizacje. Jesteś niesamowita, jestem w szoku, że chciało Ci się napisać notkę w trzech językach. como me gusta esa sudadera Aga!! Hi dear, how are you? I absolutely love the sweater, looks fantastic on you!